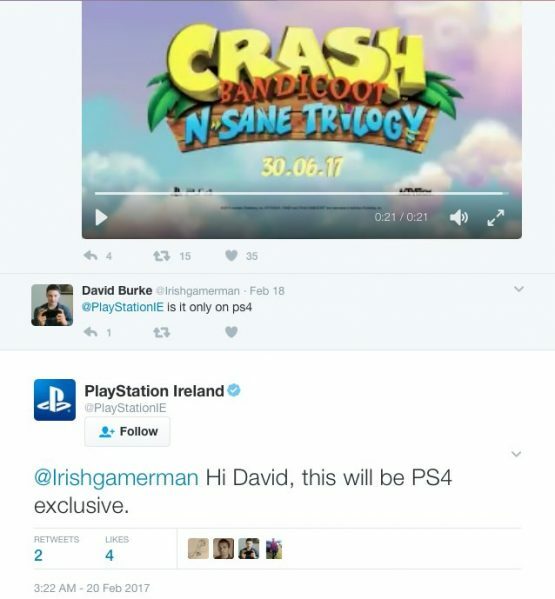 In a now-deleted tweet by PlayStation Ireland, we’re told by the company that the upcoming Crash Bandicoot N. Sane Trilogy will be exclusive to the PlayStation 4. This might have been obvious for some but there have been rumors about the title hitting other platforms due to Activision’s involvement. We’re publishing this as a report because the tweet was removed but not before people took screenshots, which ended up on sites like NeoGAF. You can see it for yourself below. However, we still recommend taking it with a grain of salt. Crash Bandicoot N. Sane Trilogy is headed to the PlayStation 4 on June 30, 2017. The AAA remaster comes with new features alongside remastered versions of Crash Bandicoot, Crash Bandicoot 2: Cortex Strikes Back, and Crash Bandicoot: Warped. “We’re giving this the love and attention to detail that we pay to all of our AAA games,” said Game Director Dan Tanguay recently. For more on the title, check out our previous coverage.